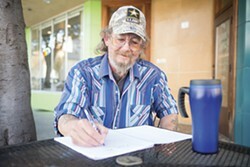 Bob Hager writes in his notebook in front of Because Coffee in Eureka. The leaves in some states will be changing soon, colors of every hue — reds and yellow, brilliant orange, still a little bit of green and finally brown — will float to earth to help bring life anew. I've traveled all over the U.S. several times over the years but, to me, no matter where, the months from October on are always the most difficult. And for the first time in a couple of decades, I'll face them alone. I am Bob Hager, though my birth name was Robert Jackson. I've been married to my lovely wife Kathleen for 17 years, although we'd been together quite a bit longer. She passed away next to me in bed on July 7. While we spent much of our 20 or so years together on the move, we got off a bus in Eureka on Sept. 1, 2014, looking to make this our home. We stayed in the Budget Motel for a little over a year but the city tossed us all out to the curb in September of 2016. (You might have seen us in the Journal.) We've been homeless ever since. If you spend any time in Old Town, you probably saw us, me pushing Kat in her wheelchair, a book in her hand. In fact, if I walked around without her, nobody recognized me. We were always together. I'm now semi-patiently waiting for this thing called "survivors' benefits" from the Veterans Administration to find out if I'll be living in a tent the rest of my life. I get $422 a month for my veteran's disability benefits, which isn't enough to do much at all. I'm staying at the Veterans Resource Center until probably January or February or March, whenever I get those survivor benefits. Then, I'll lay Kat to rest — she was cremated and I got a nice plaque. I look forward to putting her to rest so I can go visit her. The Vets center is helping me get my head and heart back together. As the season changes, I think of Halloween and how Kat and I used to have a wonderful time. But I also know November and December are right around the corner and they'll be hard. There are places, of course, you can go for the holidays to have the big meal but my innards just ain't in it. In my younger days, if you wanted to find me this time of year, you'd have to look in the nearest bar. I've grown older and hopefully wiser but, to me, the holidays just aren't much fun. In fact, they actually hurt. All those delicious smells, those holiday ads with all those smiling faces saying, "get this, buy that, you ain't right until your kidlets have this" — they are reminders of what you don't have, maybe things you never did. If you get a government check, your holidays happen later. Thanksgiving comes Dec. 1 and Christmas on Jan. 2. I'm 60 years old but I wear it well. I've now been homeless several times in my life. Over the years, I wandered in no particular direction, whichever way the wind blew. 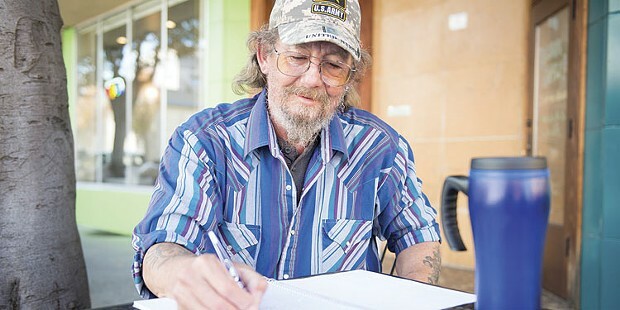 And I've learned a thing or two — enough that I've written a "poor man's survival guide," a book aimed at helping people off the streets, a few times over. I'm now working on a new edition, which is where the pointers in the list below come from. I dearly hope that this can touch at least one person's life. Meanwhile, I wait and twiddle my thumbs in anticipation that at the end of this road, I will be back on my feet with Kat laid to rest and a roof above my head. Just a place to call my own. It doesn't have to be big or fancy, merely a comfy place with my own key. You're now officially homeless. This is one of the toughest sentences you'll ever have to hear. It doesn't matter what the circumstances were that caused this tragedy, it now only matters what you're going to do about it. More and more people of late are thrust into this predicament every day. Work is getting harder to find, rent keeps getting higher, places to rent are getting fewer and harder to find. And, my friends, I really hope you have saved all your references and relationships since birth, because you will need them all. Sometimes living with friends or relatives can get you through a rough patch but try not to outstay your welcome, which sometimes doesn't take too long. And I've found from past experience that staying with either for any length of time can really stretch the limits of friendships and family ties. One can really strain a friendship, sometimes past all repair, so try not to do it often or for a long time. And if you must stay with friends, please don't bring a bunch of needless stuff with you that you might have to lug around all day. Don't be lugging a bunch of now useless crap around. It's heavy, it doesn't do what you want it to and you've got nowhere to put it. Did I mention it's heavy? You're going to be walking a lot. Only carry what you can fit into a backpack and maybe a duffel bag. Try not to tote around big garbage bags or a bunch of grocery bags, it sends up warnings to store owners and police and maybe somebody in worse shape than yourself. Backpacks are usually pretty cheap and relatively easy to come across. Most shelters can at least tell you where to get one. 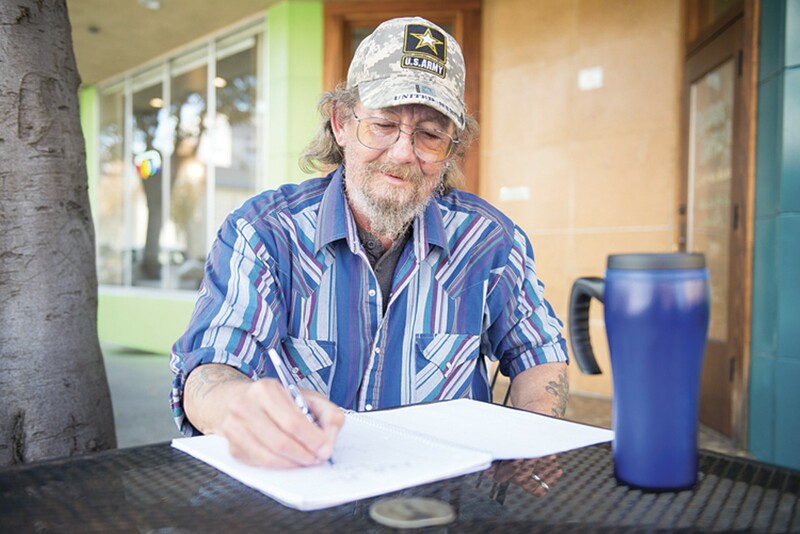 It is easier to be homeless if you're single and it costs less to get by, but be careful what friends you strike up in shelters or soup kitchens — things might just vanish while you're not looking. First things first, if the town you're in doesn't have a shelter you'll probably need to move to a larger town that does. If you have a job, it might be difficult to do this transition as the town with the shelter might be some distance away and transportation problems come into play. Now if you're not employed, then moving is a must. But that is very often easier said then done. Some shelters, well most shelters, it's a day-to-day thing. You go in the evening, eat, shower and sleep. Generally, they'll serve breakfast and send you on your way. If you have a spouse, well, things can get seriously more complicated. The women's shelter is most likely quite a ways from the men's shelter and you can only stay together if you're married with children. But do some checking before you just go gallivanting off to another town. If you've got internet, do some research on the towns you're thinking about moving to. Does it have soup kitchens or food pantries? Is there bus service? How many folks does the shelter hold and are there programs to help get you back on your feet? Sometimes if you're in a warm climate, a tent and a sleeping bag will suffice but that can have its own problems, such as finding a safe, secluded spot to camp and still be close enough to stores for grub and clothes and showers. And also the ever elusive police officers. There again, if you're lugging around a bunch of stuff, you'll tend to have more unpleasant encounters. If you have a steady job, by all means keep it — good work is few and far between and income is a top priority in the apartment game. Word hard and show them what you got because no money means no indoors. Make sure you have your information and references of past and present work and employment history, as well as references for several years of landlords' names, numbers and possibly addresses. When you have a steady place to live, most of the things I just mentioned tend to get forgotten or misplaced — no one really thinks about losing their home until it's too late. And sometimes you have to pack in a hurry. If you get to read this before you're actually homeless, try to put all your important records and numbers on a flash drive. They are relatively cheap and can hold a lot of information and they take up a lot less space than a bunch of paperwork. They are also more likely to survive rough weather and all that lies ahead. Try to wear reasonably clean clothes and take showers often. People will look at you differently if you don't look all dingy and they can't smell you a block before you get there. The locals in town will generally get to know you at least by face since most likely they'll see you all the time, at least during business hours. Be sure to clean up after yourself and leave the spot you're at better than when you got there. And one of the very most important rules of homelessness is don't drink. It doesn't help you or those around you if you're drinking a lot. It wastes money you really don't have to waste and people tend to get in more fights when they've been drinking. Store owners aren't going to look at you too kindly if you're toasted most of the time. "He can afford to drink but he can't afford an apartment. Hmmmm." And do you dangdest not to panhandle or mooch money, it doesn't do you any justice and people will be a bit leery of being around you. When you're on the street, people will watch you all the time – you really need to be on your best behavior. Also, be careful who you hang with — guilt by association holds true most everywhere. If the folks you hang with tend to get into mischief, people will think you do too, whether true or not. Whatever money you do have, use sparingly — you don't know how long it will have to last so let frugal be your name. Every penny counts. Nothing but what you need. Churches are sometimes good places for food, clothes and even counseling, if you need it, and sometimes a shoulder to cry on can be a great help. Shelters can help you find places to get work and that is a top priority in getting back into your own place. Learn what's out there and use it. The Salvation Army, Goodwill and St. Vincent de Paul are usually places you can go for various types of assistance or that can at least point you in the right direction. You can use the internet at the library. If you're a veteran, there are still more resources you'll be able to access, so find the VA. When you get some money, get a phone (although, in some places, you can get free phones). You'll need a phone number for work and housing, as well as assistance for food stamps and the like. And keep the phone paid up — it tends to be a problem when you switch numbers all the time. Another thing of major importance is a mailing address. You have to get mail so you have to get a mailing address. And some of the places you'll be going for services will demand something with your current mailing address on it — mail! Most shelters (I did say most) will have an address you can use or, if not, they might be able to tell you where you ca go. Usually, the shelter has a list of places where you can find necessities. Another important thing, as soon as possible, get a bank account and/or a savings account. Any money you have will just burn a hole in your pocket if you keep it with you. 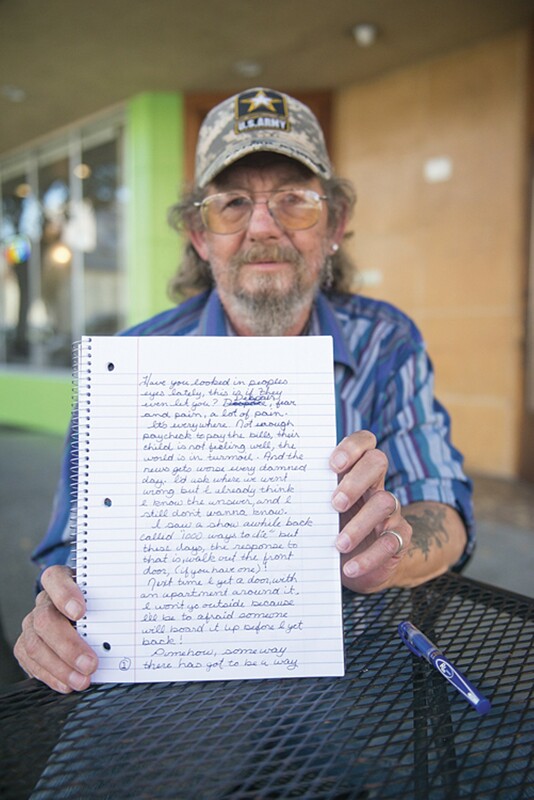 When you're homeless, that's one of the things that makes you feel like a real person — going into a store and buying something, anything. It's really hard to save money if it's in your pocket and you'll need every penny. Your next big hurdle is, of course, where to get the aforementioned money. If you're working, great, stay that way. If you aren't working, look harder. There are places to get help with resumes, applications, etc. The Job Market is a good start. When you go for an interview, be prepared. Know what you can about the business, what they do. Have your own pen, it's not life threatening but it looks good (especially if it's a nice pen). Dress good. No T-shirts unless that's all you have. But try to at least have a button-down shirt, good jeans — no rips, stains, odors. Shoes are whatever you have. But at least make them look as clean as possible. Don't cuss, don't make jokes, be straightforward and sure of what you have to offer. Try not to fidget. Fill out all the application and read it through first so you'll make less mistakes. And make it neat. Check back every few days. Do several applications a day and you'll get a job. (Never ask for a "job," ask for "work!"). Someone told me once, "work as hard at getting a job as once you get it." Maybe harder. Depending on your location, and your finances, you might want a bus pass. They are handy, especially for job and apartment hunting. And did I mention you'll be walking a lot? Get to know your surroundings — stores, library, neighboring towns, what neighborhoods not to go in! This is especially true if you're out on your own in a strange town. Be aware of what's going on around you. Choose your friends wisely. Find a nice little coffee shop, maybe a Denny's or the like. It does help if you can kind of relax around a cup of joe. It kind of makes you feel like you're still part of the human race. Plus, it helps warm you up and if you get to know the staff you can learn things. Working all day and sleeping in a shelter at night is going to be really rough and that doesn't count all the walking around in between. Try to find places where you can spend some time and try to relax. Parks are good, by the water is nice, too. When you're walking the street all day, there's just always that feeling that you don't fit in. Find someplace where you feel safe and like you fit in a little. It doesn't matter as long as you can just kick back and unwind a bit before it all starts over again. It's important not to over tax yourself even though you really want your own indoors. Don't put too many irons in the fire. Staying in a shelter while looking for work and housing, walking everywhere and carrying everything you own is exhausting. Working hard on getting where you're going is great but you can push yourself too hard, get stressed or hurt and find yourself in the hospital. That is definitely the wrong direction. Stay with your job. Even if you don't like it, stay until you find something else. Every blessed step is going to be hard and, alas, the end is far from view. You get to the point that you just want to give up but there is no give up now unless you die. And when you do get a job, treat yourself a little bit when you get a paycheck. We've all seen folks that have just given into the uselessness and just shuffle around town with their heads hung low, but you can't go there. Once you've gotten some money in the bank (if you've been saving most of it!) try to give yourself a gift, maybe a night in a motel and a nice meal just to let you know you're doing what you need to do and you've earned it. It used to be that you're rent was about a third of your paycheck but now it's like half, maybe more. And most landlords want to know that you have at least three months rent in the bank so you'll have to save every penny you can. The longer you stay on the street the harder it is to save money but you'll have to rein yourself in (and your partner) if you want your own roof above you. The search will be harder if you have pets, too. There are some things that might be able to assist you in this — like HUD, Section 8 and a couple of more. But these are government programs, so it will take a while and you will need all the ID and references stuff. You can also find housing listed on www.Craigslist.com, in the local newspapers and on bulletin boards around town. When you do finally get an interview about a place, dress like you would to get a job and, really, all the same rules apply. Show up a little early. Be polite and to the point — don't start your comedy career here. But you might have to go through several interviews before you strike gold, or at least copper. Be optimistic and assertive, but that doesn't mean aggressive. A word of caution: Be careful not to jump out of the shelter too quickly or you might find yourself back there pretty quick, too. This isn't about lollipops and roses. Climbing off the street and into four walls of your own is going to be hard. Really hard. Sometimes, it'll feel like you'll never get comfortable again, but fear not, if you're diligent, it will (eventually) happen. All I can say is, if you put yourself into it wholeheartedly, you will succeed. Bob Hager wrote this in loving memory of his wife Kathleen.